Image of Sarah Sze installation courtesy of the artist and Tanya Bonakdar Gallery. A slightly belated reaction to Claire Bishop’s controversial article in Artforum’s 50th Anniversary issue. I have the issue, article was bookmarked, and now I’ve read it thanks to Frieze’s one-page missive this month reacting to her claims in the article. Which by the way were not to be taken lightly if you are a visual artist, and take theorist’s opinions seriously. Some of us don’t fall into that camp, I do on some days. I need to be Brancusi-like in my acquisition and retention of “current art talk” thanks to anemic studio time and caring for three children under 5, so I’ll share the Brancusi version. Basically Ms. Bishop does not like artifacts or thingies, and wonders why artists don’t embrace the non-thingieness of the Internet in their work. Answer: It isn’t reluctant at all. Contemporary art from painting, performance, to social engagement and music is affected/effected and designed with the help of digital life. Whether research, flat images, or emphasis on users’ interaction – all courtesy of the Internet. The only reluctance among artists worth their salt may be to illustrate the Internet and our experience with it. Screens in galleries exist, digital artists exist, Internet art projects exist. It’s important to point out that in contemporary art critiques illustrating is the death knell. So why cite art about new media (e.g. computer screens in galleries) as legitimate art and not illustration? While not explicit “Internet art” the artist chosen for the Venice Biennale to represent the United States this year makes art that fits the rubric of Ms. Bishops’ leanings – art that describes our digital life. 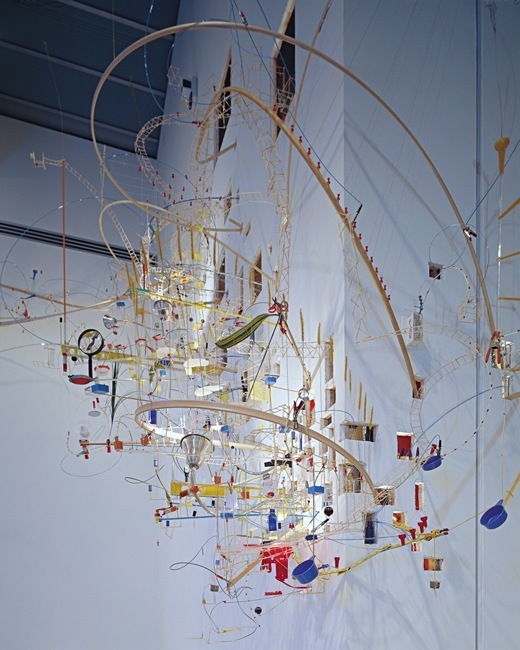 While Sarah Sze does not describe herself as an Internet influenced artist, in my opinion her work looks like a visual/artistic representation of a google search with its random collection of bits and bobs, hanging in thin air, without clear direction and with no judgement. A sort of take it or leave it feel to the work. The thingness of her work and its quality is reminiscent of Alexander Calder’s work, which soothes the many critics, art historians, pundits and panels that have validated the young-ish artist’s work. Simply put the Internet is a tool not a subject. Much like the invention of other tools like the light bulb and telephone, art has been undoubtedly and indirectly influenced by our experience with new tools. Though I don’t recall any master artists painting telephones or light bulbs. Ms. Bishop suggests perhaps the digital revolution will take the visual arts the way of theater thanks to the invention of cinema. Theater hasn’t gone anywhere, it’s alive and well simply on another scale. Visual arts are not going anywhere, people will make artifacts and analog thingies as long as we call ourselves human. Whether market appropriate or not. I believe Ms. Bishop’s stance is a sad case of an academic not seeing the forest through the trees. Academics and museums are notoriously slow to the party, all moves they make need to be supported by older scholarly texts and “certifiable artists” in the former, and older texts plus funders’ opinions to be consulted in the latter. All collectively changing direction like a slow moving ferry boat. So instead of carrying on about artists not referencing/embracing the Internet and the digital more explicitly – remember we don’t want to illustrate and do the obvious right? – I think a better question might be who is working in a matter that is NOT affected/effected by the digital? The analog is revolutionary.